Hip-Hip-Hooray!! It’s coconut pancake day!! Okay, it is no lie, I LOVE breakfast!!! Please, I beg of you, go check my Instagram page to see how much I love breakfast!! It is literally featured about every second or third post. HA!! Seriously, though, I love breakfast because I love the taste of savory and sweet together (read: eggs and toast with peanut butter and banana) and so many other combinations. I also love that the day is fresh and FULL of possibilities!! So, I am sharing a recipe that is so simple, super healthy and as much as I hate to say it, super trendy. It is very low carb, gluten free but most importantly, UBER DELICIOUS!! 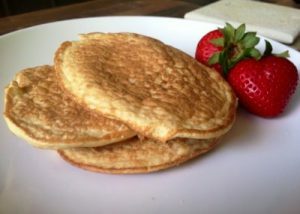 Please, try these coconut pancakes and let me know what you think! Have the most fantastic and delicious day!! These delicious pancakes come together so quickly and can even be made in batches for easy grab and go breakfasts. Directions: Heat Non Stick Pan over medium heat. Mix all ingredients in a small bowl and pour into pan. You'll know when they're done! 🙂 Serve with any toppings you like! Try with peanut butter and banana, PB2 and Honey, Almond butter and apples, Good ol' maple syrup and fruit. The possibilities are endless! Heat Non Stick Pan over medium heat. Let cook for about 3-5 minutes, then flip and cook for another 3 minutes. Serve with any toppings you like! Try topped peanut butter and banana, Almond butter and apples, Good ol' maple syrup and butter. The possibilities are endless! « Healthy Labor Day Recipe Round Up – Dietitian Approved!